Agility Design Studio is both a Business Intelligence (BI) presentation platform for analysis as well as a toolset to create robust BI views and SAP Business One transaction components for the desktop. Unlike most Business Intelligence tools, Agility allows data to be organized and then executed. For example, an analysis of material requirements can be linked to a transaction. Purchase Orders can then be created with material grouped on the same PO by vendor. The Agility Design Studio is designed to address a very broad development community in both skill sets and collaboration. Views can be designed using a drag and drop tool to allow early users the ability to become engaged as a beginner and expand to any level up to an expert level incorporating more advanced tool set components. The Agility Design Studio is also designed to create collaboration across the entire SAP Business One industry. Once a component is added, the user is guided through various screens requesting options available to each of these components. 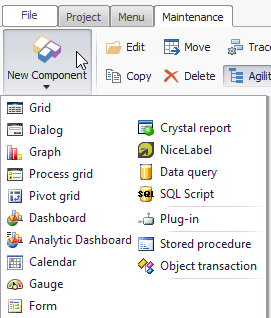 A drag and drop SQL tool is common to many of these components and allows even novice users to create simple SQL queries. The Agility Design Studio allows groups of components to be broken down into an unlimited number of Projects which can be defined by Company and deployed internally or by a developer community and easily exported and imported. Design Studio is shipped with a multitude of Projects with pre-defined views and SAP Business One Transaction options. These views can be copied and used as open templates with all the original logic exposed to be used as a base template. Design Studio also allows the creation and management of SAP Business One menus so that user security can also be managed. Each group is then only presented with the components that affects their individual needs with a user interface that is easy to use. The tool set by nature guides the developer in creating a consistent interface to minimize training on each new view. Unlike other Business Intelligence tools, no pre-processing is required. Once a new view component is built as part of a project it is simply dragged over to a menu and then the Administrator provides selected users access and visibility to that component. It is then immediately available to be used to view live data.